A great review of what we learned in school back in the 70s. Recommend for everyone! It was very informative and, with the humor injected into the movie it kept our attention. EVERYBODY needs to see this movie !! I received the movie two days after ordering. The movie is informative, an entertaining way to learn about the constitution. We’ll be watching it over and over again. Creative, informative, and a pleasure to watch. I wish they had spent a little more time on the history of some of the men who signed. Other than that, a great movie. My 12 year old grand son watched and it opened his mind to things they don’t teach in school. My wife and I are history nuts. Very good at the beginning. I think the end was rushed and it seemed to throw in some points about issues (immigration) that weren’t addressed enough. Purchased the movie to educate my daughter and was surprised at how much she already knew. Totally enjoyed the movie!!! Should be elementary school required watching, for all young americans to watch. I enjoyed this movie and am thinking of offering a copy to the 5th grade teacher at my grandchildren’s private school. An easy tool to educate about the Constitution! Great job, you nailed it. I learned a lot about our constitution. So far, I have watched the movie 2 times. It is wonderful for children and adults alike. Please produce more. I love this movie and will enjoy sharing it with my grandchildren for years to come so that they may educate others. As an adult I would have liked to see the movie go a bit further. Maybe a part 2 in the future? I really liked it. Very inspiring and educational. I would love to see it in elementary schools. I think this should be taught in school. My wife said she was taught the constitution in school. But she doesn’t remember and they should pay more attention to this in school. It isn’t about politics. It’s not a movie to agree or disagree with. These are YOUR Rights. Know them, Keep them. A powerful and timely message for all who benefit from what’s left of American civilization. Well directed and produced, yet not quite spectacular from an entertainment standpoint. Perhaps a sequel will be made where Jefferson, Adams, Washington and the gang come back and physically drag scumbag politicians out of their offices. Count me in for $20 if so. I recommend this movie to anyone but especially to young people. It would be a great family entertainment and education played in the home. I have told several people about it and i intend to lend it out. Thank you for the opportunity to purchase this. My wife and I enjoyed it very much and we are planning to let our grand children see it. 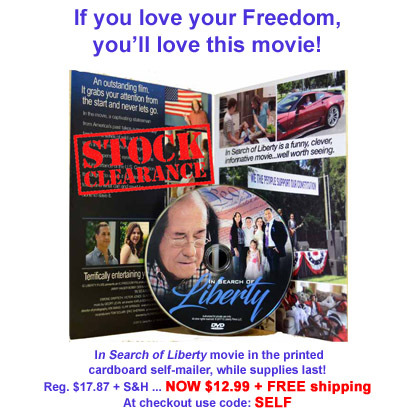 In Search of Liberty is a well put together film for the whole family! It is both educational and entertaining at the same time. If you or your family hasn’t studied the American Constitution this is a must view film. If you are Constitution aware, this will make you stand up and say YES! Highly recommend to everyone to watch and hope schools add it to their classroom lessons. I loved the factual information given in a visual way that was easy to understand. However, there are 2 incidents of swearing, one reference to playing poker, and a way-overdone house of horrors that our youngest ones (5 & 10) were scared of. None of those things really needed to be included. In future viewings (since we own a copy), I will mute the swearing and fast-forward through the scary part. But we really enjoyed the way the rest of the movie was presented. We are studying the Constitution this year, and our kids were excited to say the amendments and Bill of Rights along with the characters. Very well made movie. It should be required viewing by EVERYONE who holds a Government office or hopes to hold a Government office and by everyone who works for any Government office. Everyone in America should buy this movie and watch it with their family and friends. Our country needs a refresher course on what our Founding Fathers left us with. “In Search of Liberty” does that. I thought the movie was done very well. Not only was it funny but also very relatable in regards to what our country is going through currently. They actually apply a teaching flair throughout it that we as parents can even learn from! I recommend it being for children 4th grade on up. The actors seem to have really connected well together which makes the movie flow really well. Outstanding effort on the behalf of freedom. My family and I really enjoyed this movie! ☺ It presents the important truth of the rights given to us as Americans by our founding fathers in a simple way that even young children can understand! They did their best to protect us from tyranny. Excellent presentation for 8 to 15 year olds to learn about our constitution. Loved Ben behind the wheel of a Corvette. Educational, enlightening, entertaining…. and a bit alarming. Great Constitutional starter for young people. They won’t learn it in school. Thank you. I watched it as soon as it came. I thought it was a very creative way to share and teach what our Constitution really is. I think it also hit many Americans right in their education too as it isn’t taught today like it was when I was in school. I have never since my high school days been able to understand how anyone who studied it can say one thing negative about it but they do, mostly because they themselves don’t believe in the freedoms it provides but an agenda that wants to destroy it. We don’t have a perfect constitution but that is because of the forces behind trying to destroy it. There is no government document in the world that provides so much for its citizens. God bless America and the Republic for which we all should be thankful for having lived all our lives under. Overall, we enjoyed the movie very much. There are 2 things, though, that I would like to let you know. 1) It would have been nice to get thru all of the Bill of Rights Amendments, not just the first few. 2) The horror ride scene seemed overplayed, too long, and a bit on the scary side for younger audiences. However, I would love to see more productions like this…we need to teach these things to the next generation. My2 cents. Watched it with my family, 13 & 14 yr olds and we LOVED it!! A well made movie which highlights the important, and frequently ignored, points of our constitution. I had hopes that it could be used at the fifth grade level to illustrate the basis of our government and its laws, but it would appear to be more geared toward middle school and younger high school students. We need more of this historically accurate accounts of our nation and its laws. Thank You. When it came in, sat down and watched it with my 7th grader. We both really enjoyed the movie. Taught me some things I had forgotten and taught him a lot that hasn’t been taught in school. He brought the dvd into school to have his social studies teacher evaluate it. Then the dvd could be shown in the classroom. I loved the movie very much, I’m looking forward to more! I loved it and will promote it. I fear there are none so blind as those that “will not” see… I believe God will have His way, but those that would only find fault in such a production are the same ones spinning other false narratives. Loved the content. It was a bit choppy and a bit hokey, but it carries a very powerful message that every citizen should learn and understand. I plan to share it with my children and grandchildren. I was uncomfortable with Ben taking weapons from FBI agents, not that he was wrong to do so, but if someone in real life were to try that the problem would likely escalate and potentially be life threatening. Quite the refresher course, we studied the constitution in high school. But that was 50 yrs. ago. I enjoyed the movie. Quite entertaining and educational at the same time! I highly recommend it for the whole family, and as a Christmas gift this year. As many of you know, the understanding of the Constitution is in dire straits today. So, passing this knowledge along is, IMO, the duty of every American that values freedom and liberty. We need these values preserved and utilized for all future generations. This is a critical concept for our country today. Especially Good to share with teens and preteens. Great movie!!! Not a high budget movie out of Hollywood, but great message presented in a way that is easy to remember and grasp! It really brought The Constition to life!! Loved it! I liked the way it was presented, but the detail was a little slow in coming. The first Amendments were covered clearly, but, probably because of the amount of material packed in at the last 15 minutes, it was lost on me. Thank you for taking on a much needed task; helping citizens understand the importance and meaning of much of the Constitution. There is way too much apathy in our country right now. Good movie. Wish it went a little deeper. Well done, capturing the spirit of how America was meant to be. Simple, but probably right level for the intended broad public. It was full of facts, interesting and kept our attention. Thank you. Great beginner youth movie. Provides a good start in understanding of basic framework of this great Republic. The whole family loved it. Held attention of 10-11 year olds. Well done! A very entertaining way of reminding us what the US Constitution is all about, and what it means. Thank you! In my personal opinion this movie needs to be shown in every Church, School, and around the country. Very informative. Helped my children understand the Constitution in modern day terms. Every family should own this. I loved the movie. Though my age group was not the intended target, it was a great “refresher course” in the Constitution and very entertaining. I actually bought it for my daughter as a home schooling tool for my granddaughters, but I really wanted to watch it myself. I am sure they will love it too. My wife and I were very happy with the concept and execution of a well-thought-out history and civics lesson. Very informative and entertaining! Excellent story idea to teach the basics of the Constitution. Movie is very well done. I showed it to my group and got nothing but complements, In fact some asked for the website and I am sure will purchase the movie. Once again excellent! It was nicely done! I did notice that the end seemed a little abrupt as if you ran out of time to finish the movie though. Outstanding! Very well done and educational; should be in ALL classrooms, 5th grade and up. Would love to see more films of this nature regarding our country and its history! My wife and I enjoyed the movie , thought it would be great if everyone watched it. So many people don’t realize the purpose of the Constitution. Great job. We enjoyed the movie very much. It was a little corny and far fetched but it was also truthful, humorous, and to the point. 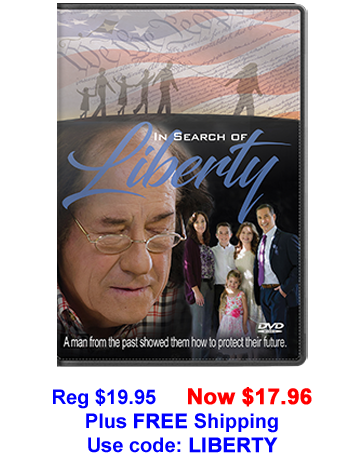 The “In Search of Liberty” movie on DVD in a traditional black case with four-color artwork. Includes the Student Study Guide and the Student Study Guide & Answers booklets. 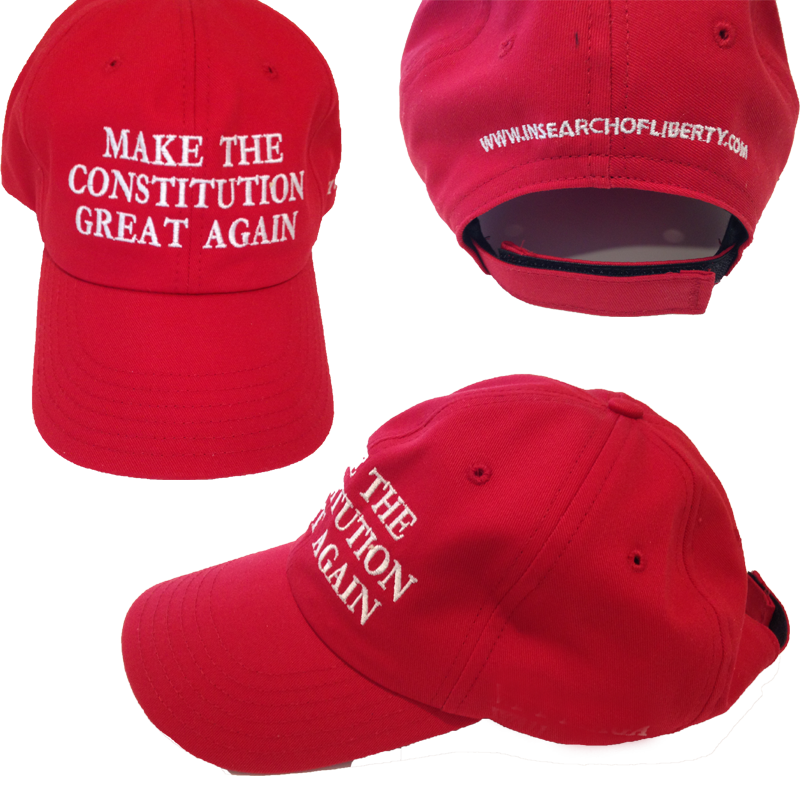 The red Make the Constitution Great Again cotton twill cap has six panels with air vents, pre-curved bill and adjustable cloth band. One size fits most. Proudly cut, sewn and stitched in the USA. The “In Search of Liberty” movie on DVD in a traditional black case with four-color artwork. Each DVD includes the Student Study Guide and the Student Study Guide & Answers booklets. Special: Buy 2 Get 1 FREE Reg. $74.85 – Now $49.90 Only $3.99 S&HCoupons not valid on this special. 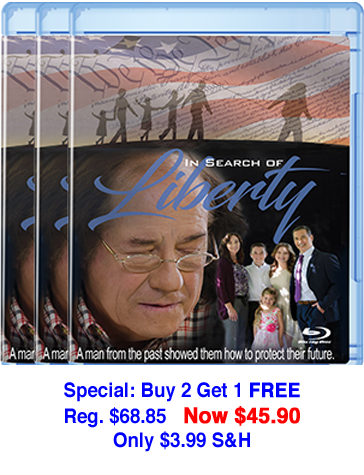 The “In Search of Liberty” movie on Blu-Ray disc in traditional blue case with four-color artwork.